You asked for it so here it is....more Mayan Ingenuity. All of these were captured in the Lake Atitlan region of Guatemala. If you are new to this series here are the links to the first and second posts. During election season in the US candidates and political parties spend millions of dollars on yard sign, billboards and bumper stickers. Guatemala does not have the same level of funding for their elections but they can spare some cash for paint. 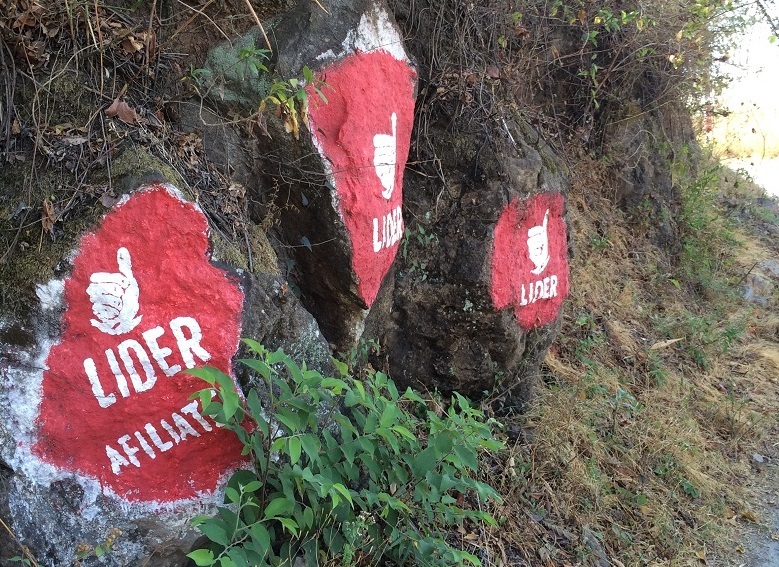 Political parties and candidates use boulders like these to advertise along the road. These "signs" last longer and create less landfill than the traditional yard sign or billboard. Once the election is done or when a community swings their support elsewhere they just cover it up. 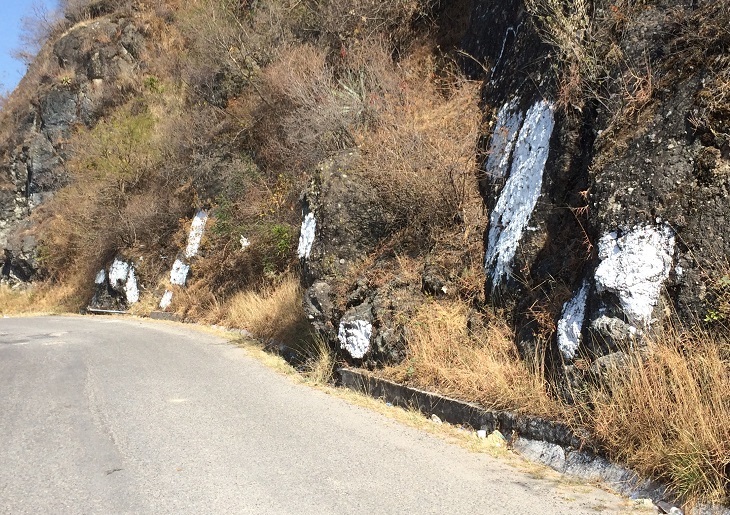 It's not uncommon to see these white splotches along the roads. Landscape lighting can be an expensive proposition but it does not have to be. Here are two examples of how to do it on a budget using recycled materials. Some buried bamboo, and an empty wine bottle or a PVC pipe with an empty, cutout bleach bottle make for easy options. Safety is a big deal in most countries but in Guatemala common sense is generally relegated to adults to teach their kids. Here's a great example. Electrical cables, panels and meters can be expensive to secure. 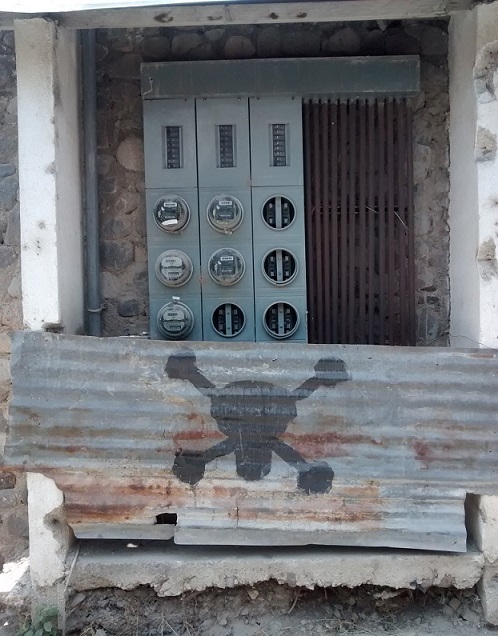 Here the electric company warns you to stay away by using a piece of corrugated metal with a skull and cross bones painted on it. Got a hole in your fence? There's more than one way to fix it. 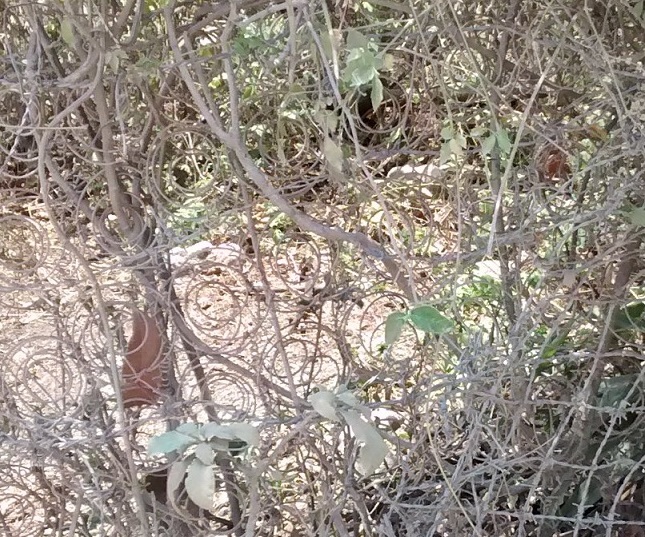 Look close and you'll see the hole in this chain link is patched with the springs of a mattress. Here's a picture of a wheelchair that we snapped while visiting the local bomberos. Apparently if you cut the legs off of a plastic lawn chair it will fit perfectly on a wheel chair base. 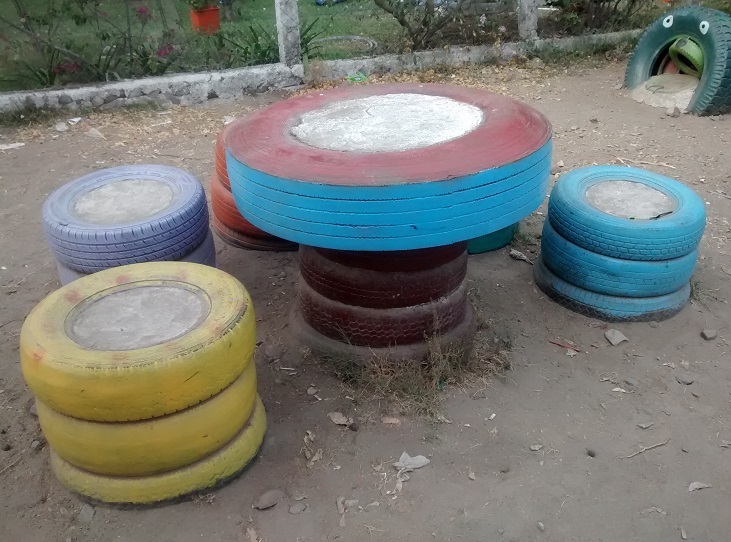 Got some old tires and unused cement? Mix them together and you have a picnic table and chairs. The chairs are actually semi-comfortable. And what would a picnic be without a bar-b-que? A few bricks and mortar were added to the tires and cement. 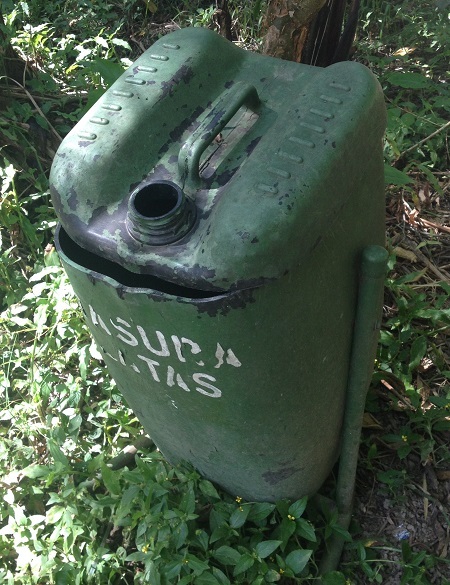 When in need of a trash can, any, and we mean any, unused container can do the trick. A few months ago some new pipes were being laid and a popular cross street was torn up. Someone "built" this bridge so pedestrians could crossover safely. This solution stayed in place and worked great for the duration of the construction (about two weeks). 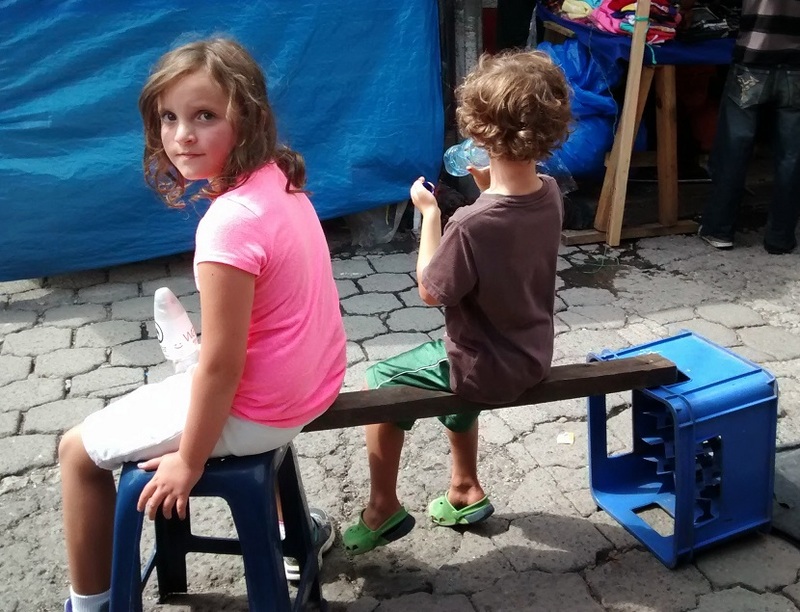 A wooden ladder with a piece of wood propped up on one end with a blue Pepsi bottle holder doubled nicely as a temporary bridge. It can be expensive for utility companies to outfit trucks with all of the rigging typically used to do their work but as evidenced in the next photo there are always other options. The support for this large spool of cable is just rope. This allows them to change things out as the needs of the day change. I do not recommend repeating this hack. When my daughter stood up she inadvertently slid the wood off the stool and my son hit the ground. Worse, he spilled the water and I was thirsty. 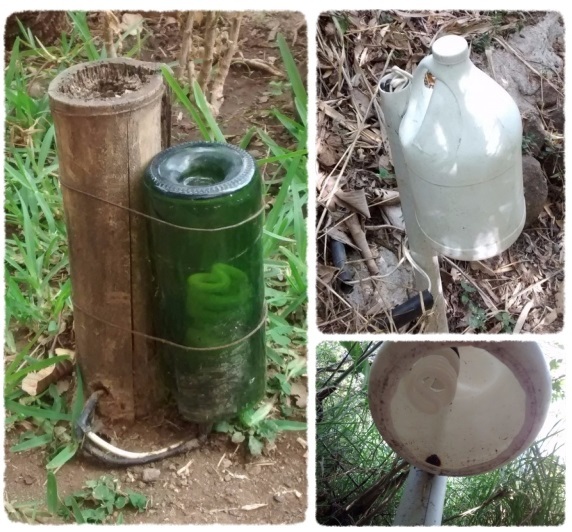 What would a post about ingenuity be without mentioning the duct tape of Guatemala aka, PVC tubing. Our friends bought a painting from a local artist COOP and needed to send it safely home. The COOP is used to this request. They measured the painting and cut a piece of PVC to the appropriate length. Rolled it up and taped the ends. Boom done!